This is the third episode in a series on freedom and China. Previous posts were about the elegant carelessness I found in Chinese culture and about feeling safe: two causes of the sense of liberty I experienced while visiting the country for a month. I want to discuss a third factor here – one with less positive overtones. Last time I spoke about anonymity. This time I’ll speak of celebrity. The more billboards, adverts and shop-windows we saw on our journey, the clearer it became that a European look is a sign of beauty in China. A big proportion of the models promoting the clothes and jewellery, cars and real estate on sale, is of European lineage. In other cases, I only thought they were European at first sight. On closer inspection, they had been made up to change, for instance, the shape of their eyes. Extra lines and glue create the impression of a ‘double eyelid’. Many East Asians even resort to plastic surgery to achieve this extra wrinkle. The same applies to other eye characteristics and to noses – which are supposedly prettier when they are bigger. Another technique, which we could study in detail in the sleeper trains we took, is to try make the skin whiter as well as ‘younger’ with (toxic) creams, electric devices, and old-fashioned slapping. To a large extent, these beauty ideals show the influence of North American pop culture, and of the history of European colonialism. Some of it – such as the whiteness ideal – may also be a much older home-grown desire, based in class politics and the division between those who had to work (in the sun) and those with leisure. But a large part of this beauty ideal that we found in Chinese cities is clearly a form of racism that values a European appearance over an East Asian. To me, these practices and desires were frankly horrid. And yet I cannot deny I benefited from them. Throughout my stay in China, I was showered with a inordinate amount of attention. And so were my European-looking co-travellers. Some would no doubt give us attention because they were curious or sincerely interested or because they like to mock a foreign tourist. However, much of the attention we got was clearly positive and amounted to admiration. The blonder, the taller, and the bigger the nose, the better. We posed for literally hundreds of photos; more than I have of ourselves. (I wonder what happened with them?) 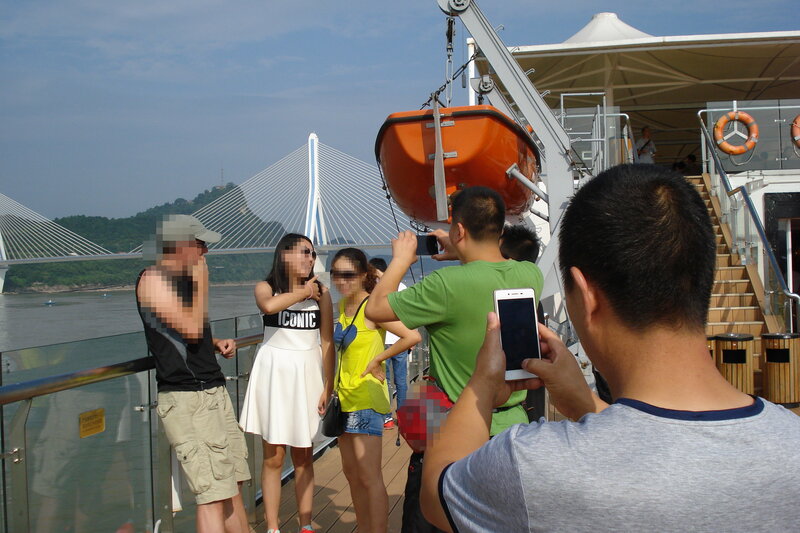 On one boat trip, an actual queue formed of people wanting to talk to us and take our photo. For our fellow tourists – our Chinese fellow tourists – we had become an attraction in our own right. We had become ‘iconic’ indeed. On the left: someone from our group. All the others in the photo: unacquainted tourists. Of course, by taking this picture, I placed myself in their company. There’s nothing like receiving compliments from strangers at any moment of the day, for boosting your confidence. And there’s nothing like confidence for making you smile and feel at ease. And, as one in our group remarked, the effect spirals upwards because the more you smile and feel at ease, the prettier you will be. China’s European bias – who knows how long it is to last? – therefore added another layer to my sense of liberty there. I had not expected to find something which I detest so deeply – privilege rooted in racism – leading me to feel so good. True, part of the reason that large chunks of my journey made me laugh and smile, were precisely because I was aware of this ridiculous situation; because I had the feeling I had stepped into a period drama, set in the age of empire. Having grown up in the place I did, I had never encountered such ostentatious privileging in real life. The situation was overly familiar, but only from books and films, which made it almost fictional at times. Have I now also got a taste of the dangerous attractions of real imperialism?